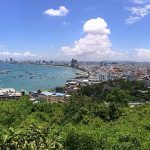 Pattaya is, along with Bangkok, the best place in Thailand to play 8 ball pool table both with nice and young Thai ladies as well as foreign tourists and expats. It’s not always easy to make foreign friends in Thailand but I think it’s a great way to meet new people by playing pool. And if you are living in Pattaya for more than just a couple of weeks then it’s really a good idea to join one of the many Farang teams who play eachother in the Pattaya Pool League once or twice a week and that way you get to know other expats a lot quicker than occasionally talking to a guy in the bar or restaurant. And obviously it’s a lot of fun and good to have a hobby, too. Anyway it’s not really difficult to find a bar in Pattaya with a pool table. This town has probably the highest concentration of beer bars in Thailand and most of them also have at least one or two pool tables. It usually works like this: You buy a drink (60-100 Baht for beer and soft drinks, 120 Baht and up for spirits, 120-140 Baht for lady drinks) and you can play pool for 20 Baht a game (however some places on Walking Street charge double of that, 40 Baht). If you come alone there are always staff girls that will play with you (they may ask for a drink) and if there are more people than tables there’s usually a board where you can write down your name and once it’s your turn you pay the 20 Baht to challenge the winner of the previous game. If you win, you can stay and play. However finding a bar with more than just a couple of pool tables and more important high quality ones and larger than the ones in most beer bars (which makes playing easier and games are finished quicker so they make more money) is a whole different thing and it was just during my most recent weekend trip to Pattaya when I discovered the perfect pool bar. I was walking along Soi Diana towards Soi LK Metro to check out some of the go go bars there when I noticed this large pool hall to my right. I thought let’s have a look at it and as soon as I walked in I knew this was what I’ve always been looking for. 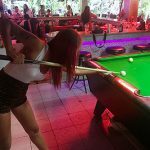 There are 14 pool tables and even more TV flat screens on every corner of the bar showing all different kind of live sport and this really adds to the sports bar feeling you cannot find easily in Pattaya. The charge for playing pool is not per game but per time: It costs 4 Baht per minute and one hour is 250 Baht (don’t ask me why the hourly rate is 10 Baht more expensive than the standard minute rate added up to 60 minutes). If you come alone there are a lot of nice staff girls who are ready to play with you if you pay them a drink. All lady drinks cost the same price as on the menu plus an additional 30 Baht, which is quite fair and transparent. Note that the staff girls there are no hookers so there’s no bar fine means if you like a girl you just ask her for her phone number and when she is finished with work or what day she has her holiday. If you want to take a break from playing pool you can just chill on the comfy leather couches or at the bar. There are pool tournaments held every Tuesday, Thursday and Sunday. The participation fee is 500 Baht per person and if you make it under the last four you get a share of the total price money of 10,000 Baht or 20,000 Baht. If you don’t want to join the tournament on these days but just play with a friend there is still about half of the tables available for rent. Coming from Second Road (Pattaya Sai Song) between Soi 11 and Soi 13 you walk down Soi Diana and you’ll see Megabreak just about 100m down the road to your right. Kiss is actually double kiss and is better than legends and mega break. All have good tables but double kiss is brand new and has introductory pricing of only 120 an hour before 6. I, as do many others, base my Thailand holidays around the pool scene, and have met many fine people and great players from all over the world. Megabreak is a wonderful venue for the casual or serious player. You may also like to check out Legends, another great pool/sports bar. the only drawback it being somewhat away from the action up off Central Pattaya Rd. Another recently opened is the Kiss pool and sports bars along 3rd Rd. I’ve not been there yet, but it looks good also. Should mention Bangkok while I’m at it. Best places along Sukhumvit are Hustlers, underneath the Times Square building between sois 12 and 14. Sportsmans soi 13, and Sports Academy above the Bush Garden in-between sois 11 and 13. Others include Players, near soi 14, down a little alley right on Asoke (can see it from the skywalk), and Breakers bar soi 13. Whatever your level of play, you will find action in these rooms. Hustlers in particular, attracts the best from all over the world and is where many of Bangkok’s big games are held.